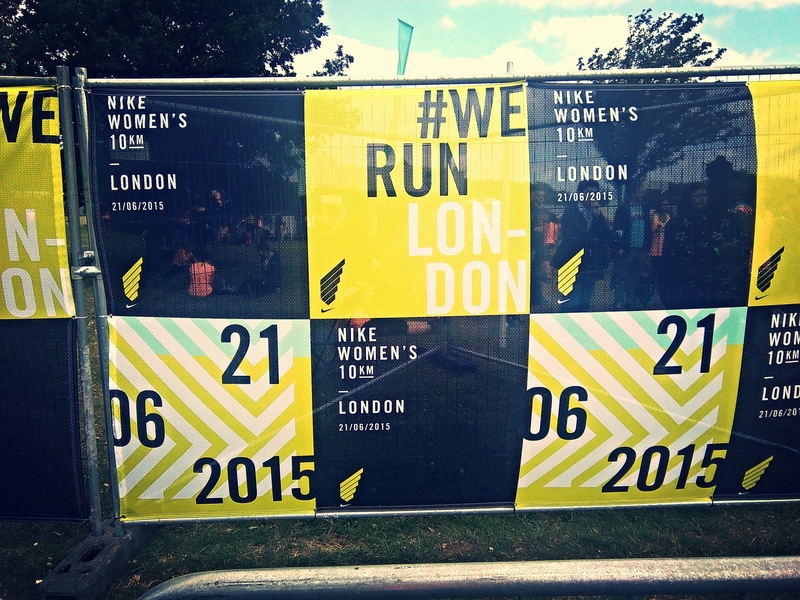 Sunday saw 10,000 women take over Victoria Park, where Nike hosted We Run London, Women’s 10km race at Victoria Park. It’s been an incredible journey to the run up to this race, we trained hard, we trained strong. 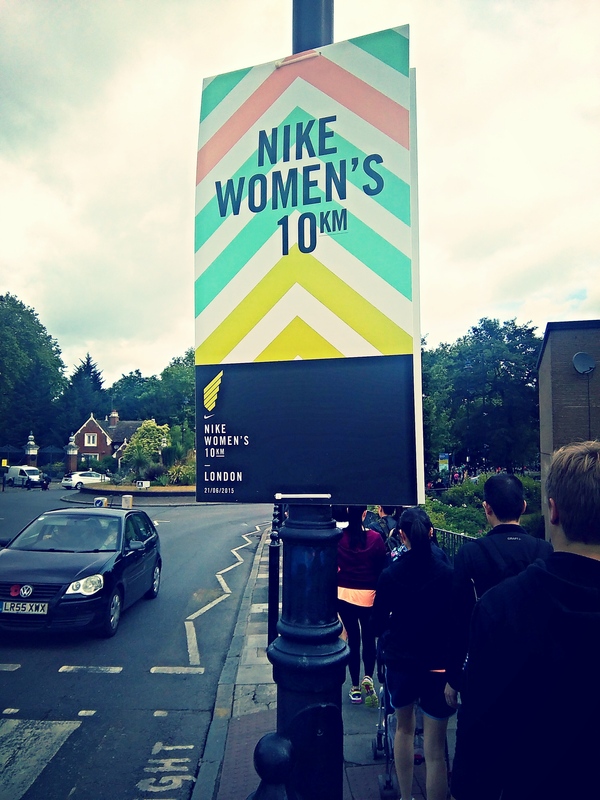 Nike took us through some amazing training from an epic NTC event at Spitalfield’s Market, to the longest run from West to East and a speed session on a rooftop car-park. This year it was themed around Who Runs the World!? 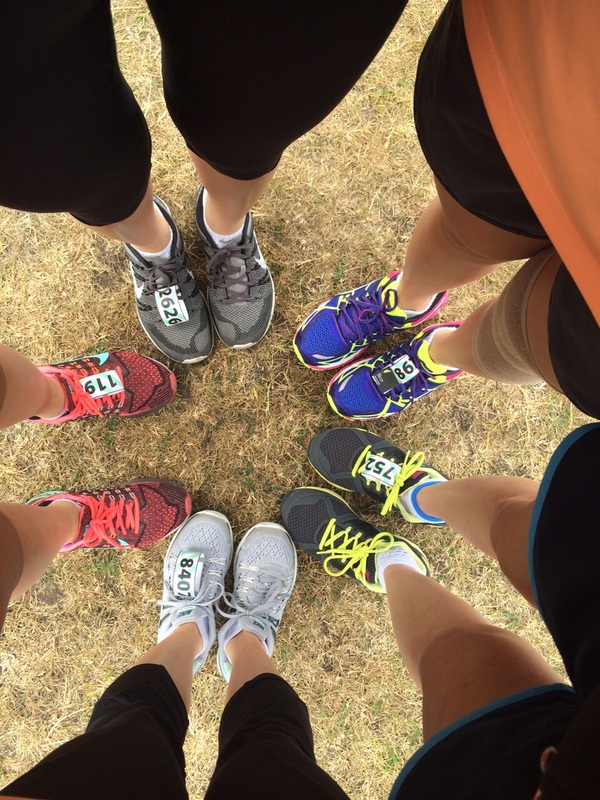 and Crew Love with lots of girls forming teams to run together. For the past two years, this run has always been at night, but this year it’s a day run. It will definitely feature some similarities and also some differences , but one thing I can say it will always challenge me to achieve a new PB. There was lots happening at the race village with many stalls offering food and drink pre and post race and of course plenty of water from Glaceau Smart water. 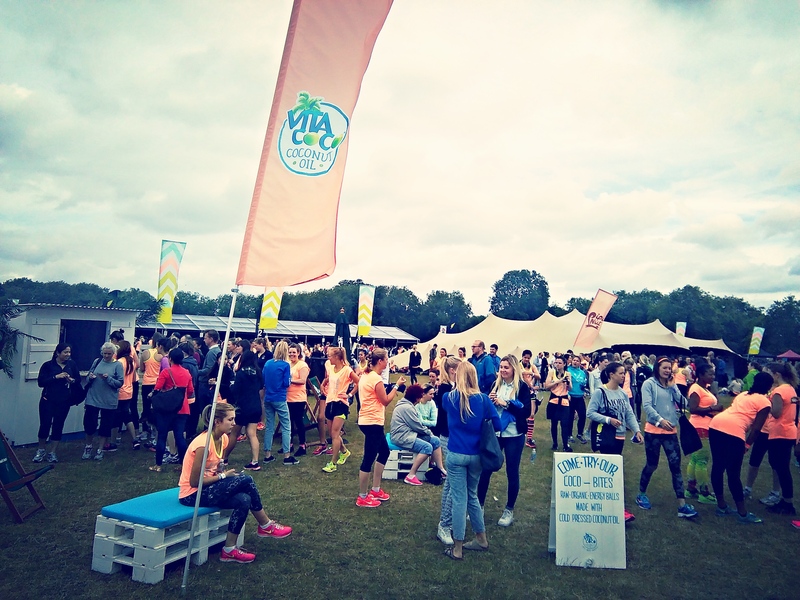 Brands included Metcalfes Skinny popcorn, Vita Coco, Wheyhey protein ice-cream. There was also the Braidbar and the Spotify Silent Disco. This year I challenged myself to beat last year’s time and to get a new PB, so I thought why not choose the sub 50 wave (purple wristband)… I may be a bit ambitious but I can only do my best. 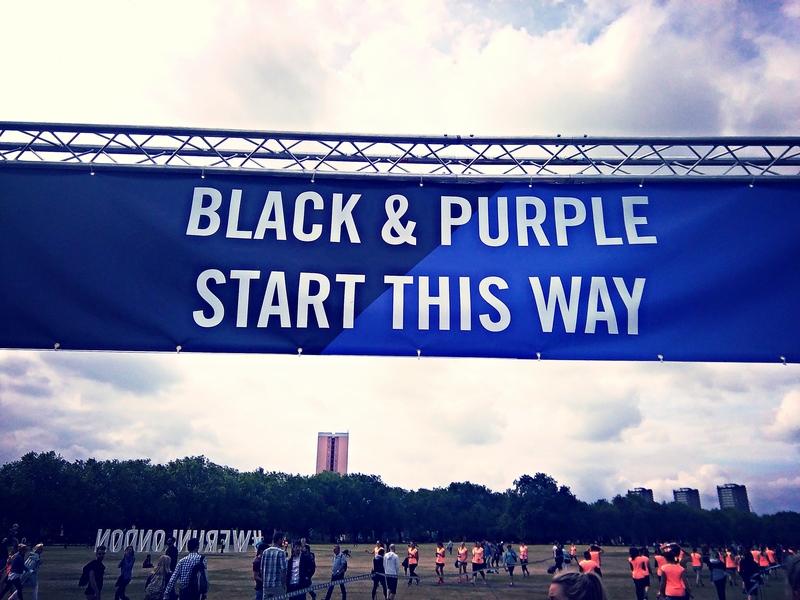 The start pen for the black and purple wristbands were together, this did make me a bit nervous as I would be running along side sub 45 runners. But lucky I had a friend running with me, so it wasn’t too bad. 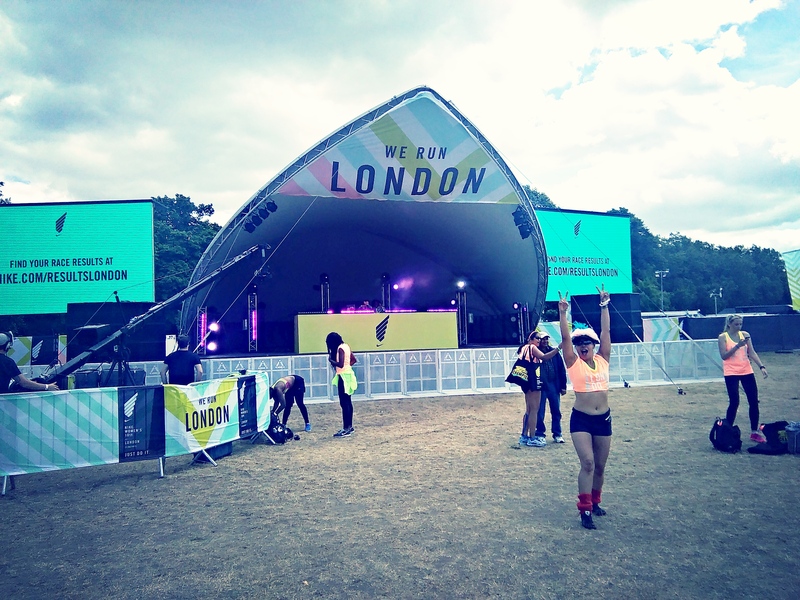 The atmosphere was absolutely amazing, music was pumping. We had already warmed up with the other 10,000 girls taking part in the race, but when we got to our start pen Sonja Moses took us through another gentle warm-up. She was awesome, really enthusiasm and full of energy to get us ready for the race. I was expecting Ellie Goulding to be at the start line, but then she came on stage and told us she wasn’t able to run due to illness. Instead she to wished us luck, and counted us down. There was a lot of runners, I started off slowly but gradually picked up my pace. I had put my Nike+ app on my phone and left it running in my bump bag, which I had on my waist. I listened to music on my ipod throughout the run, so I had no idea of my speed or time. I thought this was a good thing because I didn’t have the pressure of keeping that time. I was familiar with the route (2 laps to complete the 10km) as I’d taken part in the previous years, but I didn’t anticipate it to be so hot. Lucky I did managed to grab some water on route which really helped. I started to pick up my speed on the 2nd lap, it proved quite difficult as there was a lot of dodging of other runners. But I kept with it and continued strong, and I finally saw the corner for the finish line. It was 600 meters, then 400 meters and by 200 meters I really pushed myself and sprinted to the finish line. First thing when I got there, I quickly grabbed my phone out to check my time… I was pleasantly surprised with my time and it didn’t matter it wasn’t a sub 50. I knew I did myself justice and got a new PB. Runners grabbing water and a banana after reaching the finish line. All the hard work paid off, the training sessions with Nike really helped me achieve my goal and gain a new PB. Thank you Nike pacers and NTC trainers. 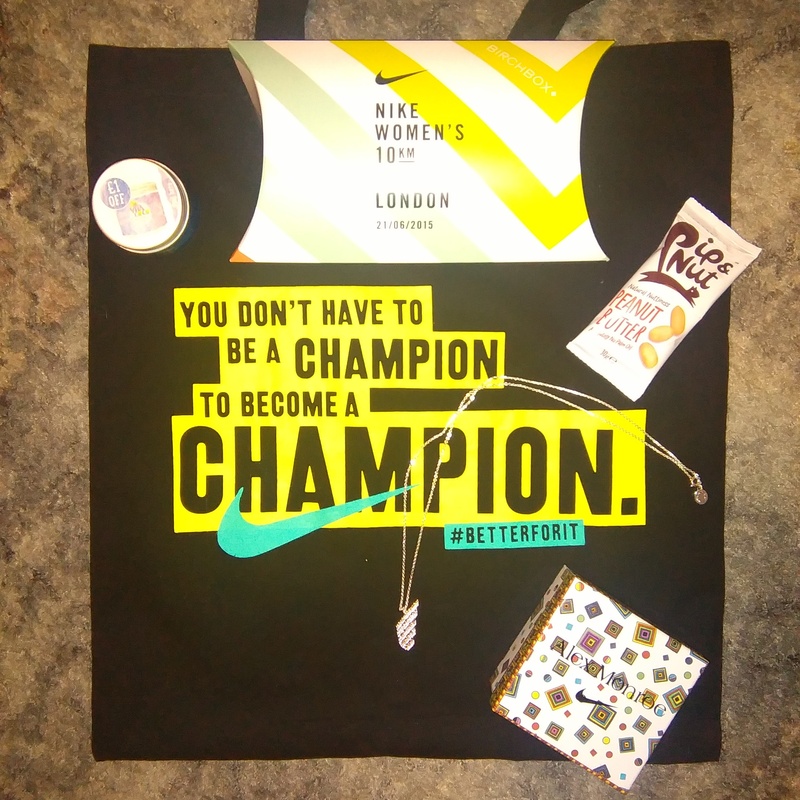 I was delighted to receive my Alex Monroe’s finishers necklace and goodie bag (featuring a Birchbox, Pip & Nut peanut butter, Vita CoCo oil). 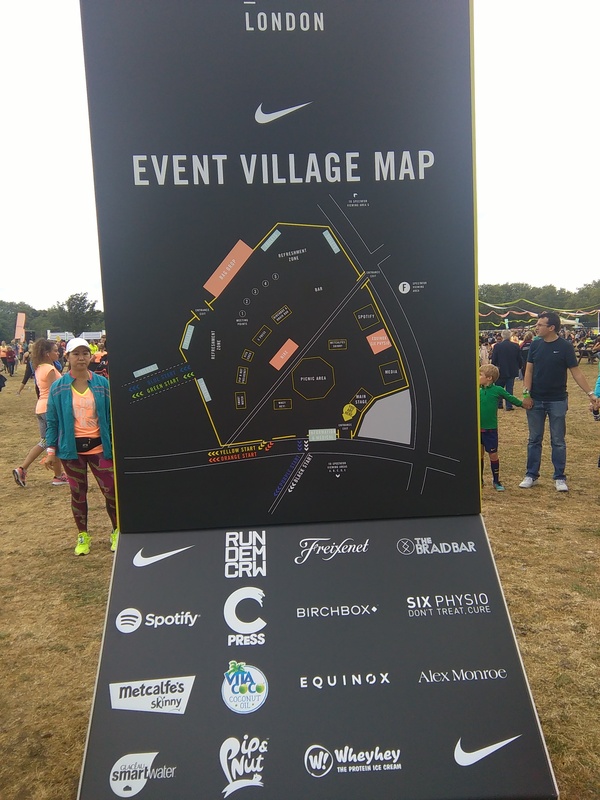 After the run, I managed to meet up with some friends and walked around the village to look around the stalls before heading home. 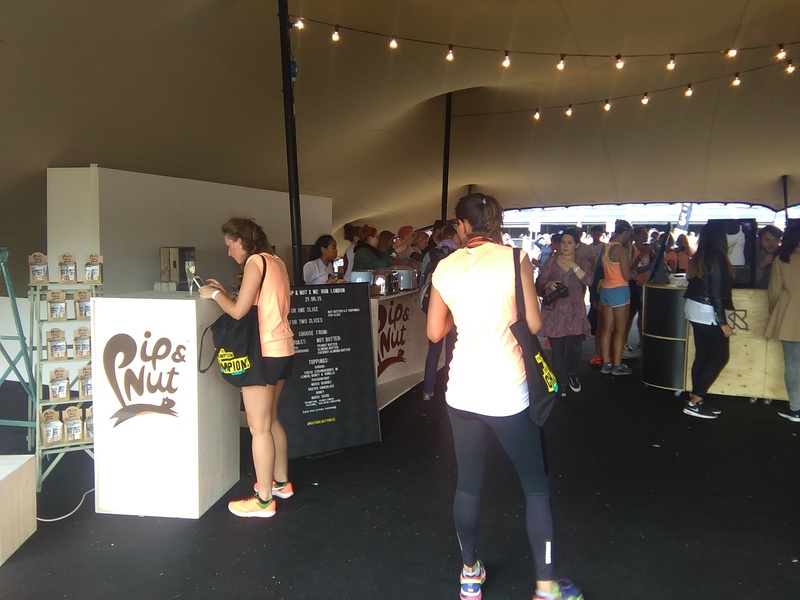 Delicious Pip & Nut peanut butter and finishers custom t-shirts stand. 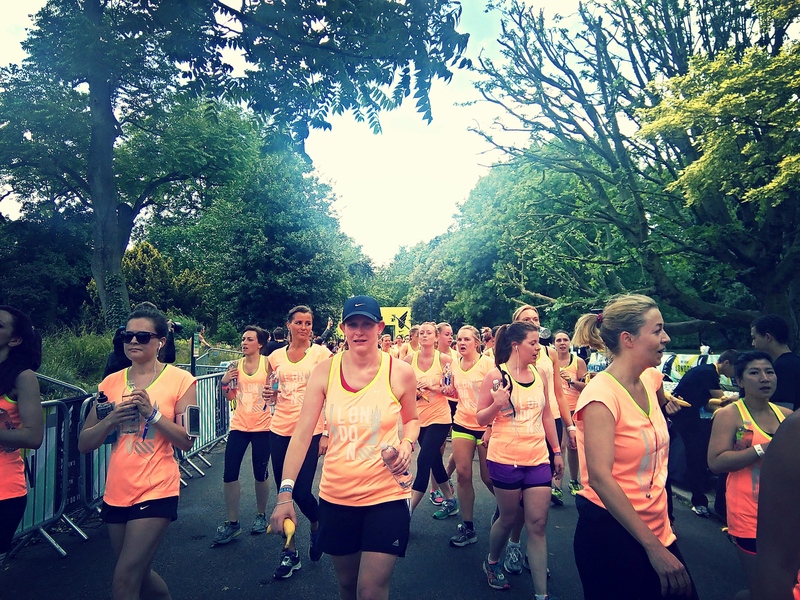 The Better For it campaign really helped us through this race, words of encouragement on route ‘Queens of the Jungle’, ‘You don’t have to be a champion to become a champion’, ‘You won’t know you’re limits until you pass them’. Shame I didn’t stop to take pictures as I was concentrating on getting a good time. Nike can never let us down, yet another great success. 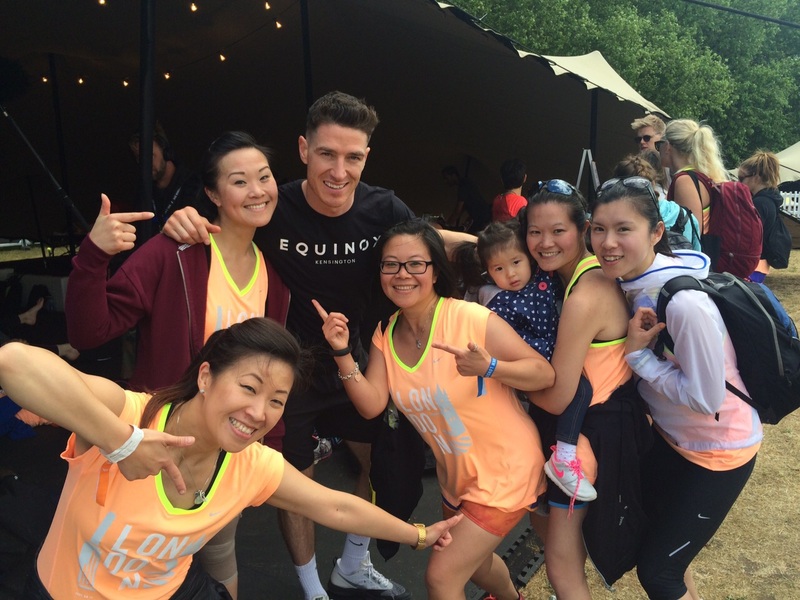 It gets better and better each year, awesome event and very well organised. Looking forward to next year! 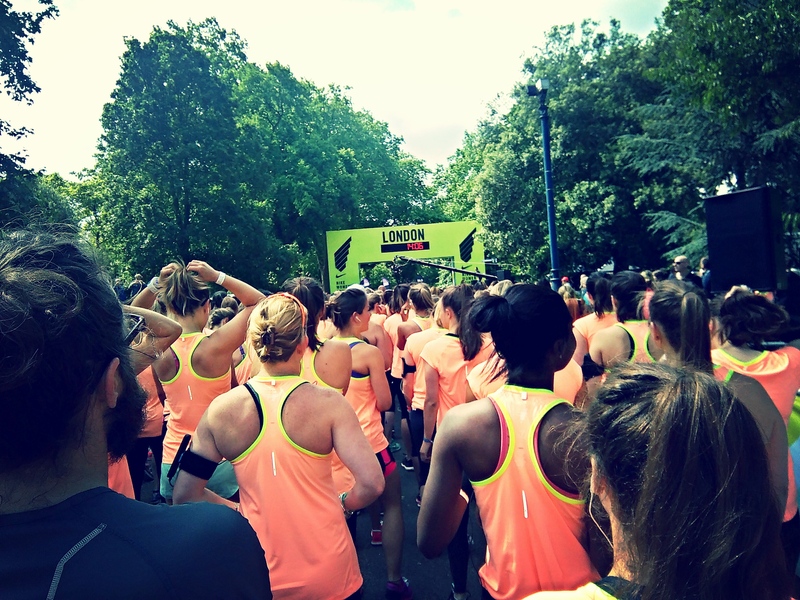 The Nike 10km may have finished but training doesn’t have to, sign up for classes at NT+C London or NRC run club (various locations).